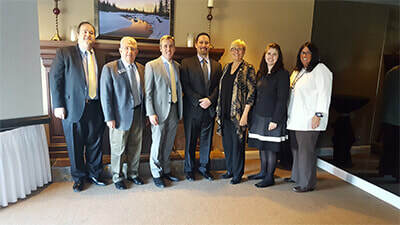 The Hunterdon County Chamber of Commerce is a proactive partnership of businesses whose mission is to support the success of our member organizations by promoting a favorable business climate and by providing leadership, business and professional development. The Chamber also promotes, coordinates and faciliates the Leadership Hunterdon initiative in the County. The Chamber sees its role in the promotion of tourism as a primary responsibility toward maintaining vitality in its municipalities and among its business. ​On behalf of the Board of Directors, Staff and members who make up the Hunterdon County Chamber of Commerce, welcome! We are a pro-active partnership of businesses, approximately 600 members strong. To be sure, the "we" is the volunteer membership that drives the committees and activities of the organization. We serve as a collective voice for business where and when it matters. We invite you to visit our website again and again to keep up to date with the activities and programs, news and resources that are constantly changing in our vibrant county. This year, your Chamber continues its commitment to “create an environment for healthy economic growth,” in Hunterdon County and continued to provide superior value for our membership. Your membership and support enables the Chamber to focus on this economic growth for our county, which benefits you, our members. In 2018, the Chamber continues to take a very active role in advocating on a variety of issues that impact all of us in Hunterdon County. Another example is our support of the redevelopment plan for the County seat, Flemington Borough. This will ultimately result in jobs to our local area but most importantly, it will bring confidence back into the commercial real estate market that is so needed today. The economic impact on a project like this real; new jobs mean more business for our local professional services, restaurants, shops, etc… All these pieces of the puzzle make for a strong County economy. There are many other examples in which we act as an active advocate for businesses and organizations here, in Hunterdon County and throughout the State. As our county faces increased competition, like the rest of our region and state, the “Business Voice” of Hunterdon County needs to be heard now more than ever. The competition for business will continue and the Chamber is committed to retaining a strong business community and strong economic growth for our membership. With a membership renewal rate over 86% each year, increased program participation and support from many organizations through sponsorships, your chamber is poised for a strong 2019. However, we do not take any of that for granted. The Chamber recognizes that only healthy members can ensure a successful Hunterdon County Chamber of Commerce and we will do everything we can to help you thrive. An investment check means more than working capital for the organization. It represents an endorsement of the work we have done in the past and a statement of trust in our future direction. The Chamber will work every day to earn that trust.